The sun being out this beautiful morning must be a sign of great things to come today Saturday May 27th. What is better than celebrating the anniversary or grand opening of a local brewery? How about celebrating a grand opening AND an anniversary?! That’s right, Richmond. Today is a twofer!! First up, over in Powhatan, Fine Creek Brewing will open their doors to the public for the first time this weekend, May 27 -29, from noon to 7pm each day. The pictures that I’ve seen of the taproom are simply stunning! Plus look at that tap list for the weekend! I know a certain someone that will love the fact there is lemon zest in this cream ale. Also,thank you to the hand zesters! Keep up to date with Fine Creek Brewing on their Facebook, Twitter, and Instagram pages. Robust and malty, this rich Biere de Garde, “a beer which has been kept and lagered”, is a traditional artisanal ale brewed in early spring and kept in cool cellars. The Queen’s Garde personifies this tradition with its toasty character and sweet caramel notes. In addition to nine other beers on tap, Castleburg will have music from The Killer B’s RVA (7-10pm) and food by RVA New York Style (2-8pm). Richmond, another Memorial Day weekend is upon us! Whether you’re just looking for a beer to take a cookout or if you’d rather leave the cooking to the professionals, I have your look at the days ahead. It’s the Thursday before a long holiday weekend. If you’re headed out of town or headed to a backyard barbeque, you need to stock up on the juice that keeps the party going. Lucky for you Steal the Vessel day has arrived. Purchase To-Go beer for a Growler, Grunt, Blue Ball mason jar, or CAN-ABLE Crowler, and receive the vessel for free every Thursday. Already have plenty? Bring back in your Strangeways glass for discounts on refills. For all you holiday travelers coming through RVA, stop by… we’ve extended Steal the Vessel for the entire holiday weekend. Take a little strange on vacation or home with you. She’s more lethal than ever. Double citra and double mosaic for an even heavier hop punch. Available for the first time ever in cans, this Friday in Fulton, 5/26. 4x 4packs per person limit. Tomorrow's can release at Fulton starts at 12p. 4x4pk limit. Be careful, she's lethal. COTU has prepped the soundtrack for your weekend with their 5th annual Summer Moon Music Festival featuring two days of 13 local bands battling to support the charity of their choice. New to the festival this year is the addition of an acoustic stage to up the live music factor. In addition to the regular lineup of beers, COTU will be pouring their Summer Moon Raspberry Lemonade Wheat Ale, a summer ale brewed with 600 pounds of fresh raspberries and the zest of 700 lemons. An extra long weekend deserves monstrous beef ribs from ZZQ. I have been waiting very patiently for this beer to come out. Cuvee Peach is the newest addition to Hardywood’s barrel series line. Rather than beer from barrels aged the same amount of time, Hardywood has taken a blended barrel approach where their Peach Tripel was aged in chardonnay barrels anywhere from 10 weeks up to two years. Ethen Adams, Hardywood’s Wood Cellar Manager, explains more on that here. The music continues for day two of COTU’s Summer Moon Festival. 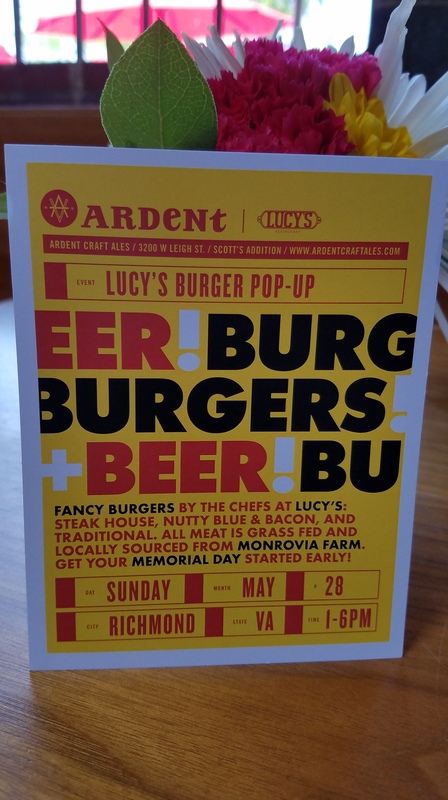 Have a Sunday Funday and let Lucy’s and Ardent take care of the burgers and beer! Celebrate 10 years of Sculpin at Southern Railway Taphouse tomorrow Thursday May 25th starting at 4pm. Looks like Ballast Point’s east coast brewery just outside of Roanoke is just about ready. Richmond, it is once again time to celebrate American Craft Beer Week (May 15 – 21). Three Notch’d RVA Collab House will be have something in store each day of the week but tonight’s kickoff will be something else. 3NB has been saving up some of their favorite RVA collaboration beers and will tap them today May 15th starting at 4pm. Head over to the Facebook event for more information and updates. The unofficial bikers’ beer of summer returns threefold today May 11th at Strangeways. Three thirst-quenching radlers rolling out together in one release! Originally brewed in honor of the UCI Road World Championships in Richmond in 2015, this style has been dubbed a hammock beer, a lawnmower beer, and a porch-swinging beer thanks to it’s easy-drinking characteristics and low ABV. This is one brew you can enjoy all.day.long. The Radler style was invented in the Roaring 20’s by Bavarian Franz Xaver Kugler. The story goes that Kugler had arranged for the construction of a twelve mile bike trail through the forest from Munich straight to his establishment, in an attempt to improve business by catering to a post WWI emerging movement of recreational cycling amongst the working class. A good problem/bad problem arose when 13,000 cyclists descended upon his beer garden on a fine Saturday in June of 1922. While Kugler counted heads, he quickly surmised that he did not have enough beer to quench the thirst of all his patrons. Being a sharp businessman, the quick-thinking entrepreneur remembered he had several thousand cases of lemon soda in his cellar, a beverage that had proven a tough sell to the beer-loving Bavarian public. To save the day, while at the same time liquidate some virtually useless inventory, Kugler mixed his lager beer with the lemon soda. To further entice the cyclists to try his new creation, he dubbed the drink the Radler, which is Bavarian dialect for the German word Radfahrer, or cyclist in English. He whimsically told his customers he had developed the mixture to keep them upright on their bikes during their journey back to the city. Needless to say, it became a lasting tradition that carries on to this day in Germany. Prost and ride on! Saturday, May 6th, marks the 16th annual Big Brew Day sanctioned by the American Homebrewers Association. Homebrewers from around the world choose from predetermined recipes to brew on that day. AHA is celebrating Big Brew’s birthday by by providing three sample recipes from the upcoming 4th edition of How to Brew. Starting at 10am, Richmond’s oldest local homebrew club, the James River Homebrewers, will be brewing at Original Gravity over on Lakeside Ave. This is a great opportunity to learn how beer is made and promises to be a great time for all. So drive on down and join on the fun. Get there by 1pm to join in on the worldwide toast. Check out the Facebook event for more information. UPDATE: Sierra Nevada has shared the homebrew version of their Ruthless Rye IPA. Cinco de Mayo is this Friday May 5th. In the beer world that means you drink lagers, specifically Mexican lagers. Richmond, if you are looking for a local option, you are in luck because both Hardywood and the Veil will have events Friday evening featuring their own Mexican lagers starting at 4pm. It’s First Friday AND Cinco de Mayo! Our taproom opens at 4PM with a new draft-only beer, Blancoveza, a crisp and clean Mexican-style lager from our lead brewer, Kevin Storm. Beat the heat and kick off the weekend with a refreshing glass of this classic style! Tonight’s entertainment (5PM) includes vinyl DJ’s and original artwork being created on the spot! Wax Museum is a curated audio-visual experience presented by some of RVA’s most established vinyl selectors in collaboration with Hardywood and NATIVES. It is a celebration of the analog beauty of record album culture in this hyper-digital era that we live in. This monthly event brings the public closer to classic creative soireé environments while also blending unique “flavors” of sound similar to the variety of brews on tap at Hardywood. Sammich will be here serving great eats all evening long! Cinco de Mayo & Jackson Flavor can release at the Veil Brewing Co.
Come celebrate Cinco De Mayo with us and Intergalactic Tacos. We will be releasing our Mexican Lager, Jackson Flavor in cans and on draft ($12+tax/4pack; approx 90-100 cases; 3x 4 packs per person). Intergalactic Tacos will be slinging tacos until they sell out. Open 4-10pm. Come Hang! There are no limes required for these beers but no one will fault you if you feel like partying.